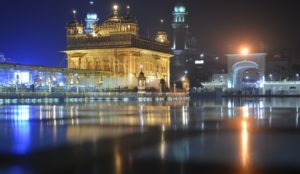 Why is Amritsar regarded as the Golden City? Amritsar has been chosen as one of the heritage cities for HRIDAY – Heritage City Development and Augmentation Yojana scheme under the Government of India. Positioned 455 km northwest of the national capital and 217 km northwest of the state capital, the city is believed to be the Ashram site of the Ramayana writer, Maharishi Valmiki. The nearby cities, Lahore and Kasur, were believed to be founded by Lava and Kusha. During Ashvamedha Yagna by Lord Rama, they captured the ritual horse and tied Lord Hanuman to a tree near the current position of Durgiana Temple. Amritsar offers the most important pilgrimage site of Sikhism. Golden Temple or Sri Harmandir Sahib (the abode of God) was built around a man-made pool by Guru Ram Das in 1577. The fifth Guru of Sikhism, Guru Arjan, placed a copy of the Adi Granth in Harmandir Sahib inside this temple. Sikhs have been rebuilding this temple after it became a target of Muslim armies from Afghanistan and the Mughal Empire. Maharaja Ranjit Singh, however, rebuilt this temple in marble and copper in 1809, coated the sanctum with gold foil in 1830. It turns the temple into the Golden Temple. More than 100,000 people visit the Golden Temple daily. It has already been nominated as a UNESCO World Heritage Site. 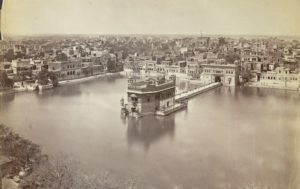 What are the famous places to see in Amritsar? Amritsar City is positioned at an average elevation of 234 metres. It has a semiarid climate, and experiences four seasons – summer season, winter season, monsoon season, and post-monsoon season. The winter lasts from December to March, with a temperature range from 0°C to 15°C. The summer lasts from April to June, with a maximum temperature of 42°C. The monsoon season lasts from July to September and the post-monsoon season lasts from October to November. The annual rainfall received by the inhabitants of this city is about 681 millimetres.